Read here about the products and the science behind the products that can tackle vine weevil, aphids, glasshouse whiteflies, leaf beetles and sciarid flies. As part of its Levington Advance Solutions package, ICL Professional Horticulture's team of knowledgeable advisors works with commercial growers to develop tailored growing media programmes for their nurseries. One of the team’s key priorities – which completes its ‘Grow, Nurture, Protect’ offering – is to help protect vulnerable young nursery stock from weed, insect, and disease threats. Growers who have lost valuable crops to pests and diseases will no doubt appreciate the importance of preventing such outbreaks. Thanks to its successful partnerships with world-leading experts, ICL is able to offer growers time and labour-saving plant protection solutions. Some of these, including the application of Exemptor® from Bayer, see the plant protection products (PPPs) conveniently incorporated into the growing media before potting. Dr Colin Mumford, Bayer technical manager, describes Exemptor® as "a valuable tool for nurseries to combat black vine weevil." He adds: "With vine weevil, the problem is two-fold because both the adults and the larvae damage the plants. The adults emerge at night-time and feed on the leaves. The plants’ aesthetics are affected as the damage is visually unappealing, however the adult pests rarely cause death. "The real damage is from the larvae. They feed on, and therefore sever, the root systems, which become unable to take up nutrients and water. This subsequently kills the plants." Mumford reveals that it tends to be in container-grown stock where the issue is more widespread. 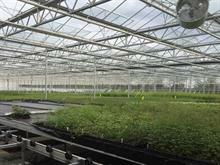 "There’s a limited resource from which the plant can take water and nutrients. So, they’re ‘sitting ducks’ where vine weevils are concerned. These insects still affect soil-grown plants, but the issues tend to be less severe." The insecticide works by both direct contact with the larvae as well targeting the grubs through the plants’ systemic absorption of the product. "When they feed on the root system they ingest the active ingredient, thiacloprid," explains Mumford. He also notes that a key benefit of Exemptor® is that it binds very strongly with the soil and therefore does not leach easily. "Other products are very mobile in the soil but thiacloprid is not. So, there isn’t the worry of it washing out of the soil system and down the drain." ICL’s sales development manager, Martin Donnelly, reveals that Exemptor® offers up to 38 weeks’ control at its higher rate (400g/m3 of compost), and 17 weeks at its lower rate (300g/m3 of compost). He says: "This is really useful and convenient because, in the majority of cases, ICL mixes Exemptor® into the growing media for the growers – who then just have to pot their plants up and water them in. "And as they don’t have to apply subsequent drench or spray applications they are minimising their water use and cutting out that extra labour. Also, when the product is mixed in by us they know it’s been done correctly." Mumford adds that Exemptor® – which can also be used to treat aphids, glasshouse whiteflies, leaf beetles and sciarid flies – is safe for bees so has approval for use in openly flowering crops. While Exemptor® is a neonicotinoid (neonic), it is a highly-developed, third generation neonic that is outside the scope of the current EU ban on neonic seed treatments. "While it is an EU candidate for substitution in some countries, there are no such issues in the UK and growers can continue to access and use products containing thiacloprid as before." Furthermore, Exemptor® does not have any resistance issues – making it a good management tool during a time when many strains of horticultural pests are becoming increasingly immune to groups of insecticides such as organophosphorus and carbamate compounds. Mumford notes that Exemptor® has received a very positive reaction from growers – who can use this PPP alongside cultural and biological controls. These measures include removing opportunities for the insects to hide in material such as mulches, and the application of nematodes into the soil. 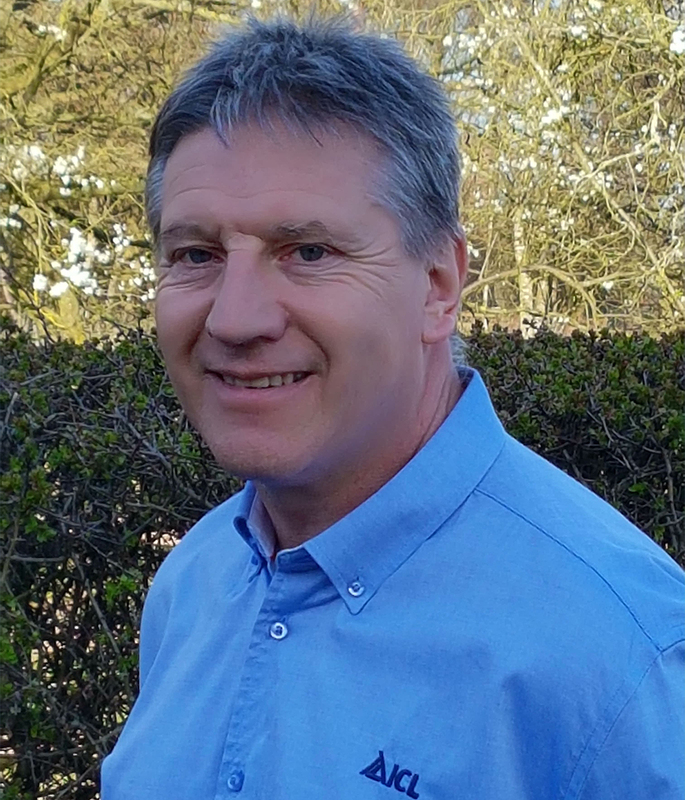 As nurseries continue to become more confident in using biological controls as part of their integrated disease management strategy, a biopesticde named Prestop has recently joined ICL’s offer to growers. This protectant (not curative) biological fungicide is offered to them as part of ICL’s exclusive global partnership with Lallemand Plant Care. The product contains the mycelia and spores of the naturally occurring soil-borne fungus Gliocladium catenulatum (fungal strain J1446). This occupies plants’ root zones to protect them against a broad spectrum of damping off, root or base rot diseases – including pythium, phytophthora, rhizoctonia and fusarium. Donnelly explains: "Growers are realising that they can’t solely rely on chemicals – the range just isn’t there anymore. So, they have to have a protectant programme as part of their integrated disease management. 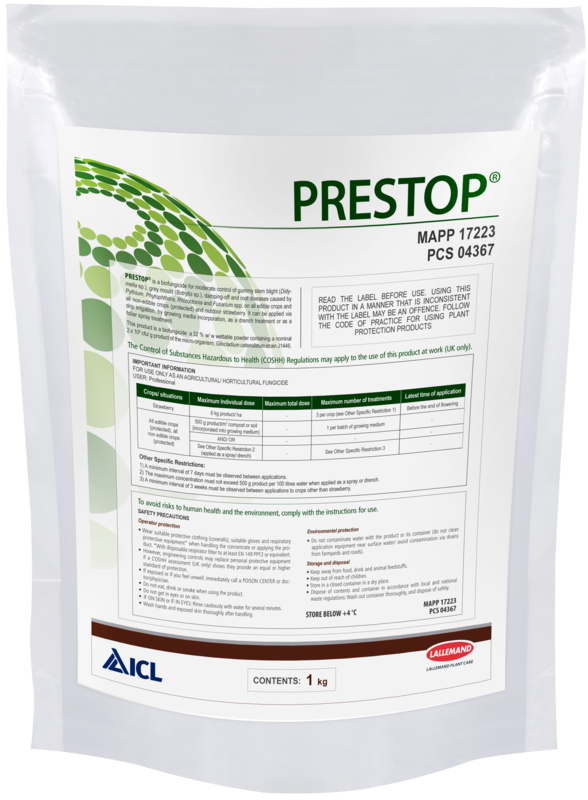 "Prestop is a preventative product that can be mixed into the growing media as a granule either by the grower or, as normally happens, by ICL. Applying it this way will give crops, at the 500g per m3 rate, up to six weeks of defence against those fungal diseases that can be particularly damaging at the early stages of a plant’s life cycle. "Following this initial period, growers can then dilute Prestop themselves and apply it every four to six weeks as a spray or a drench. 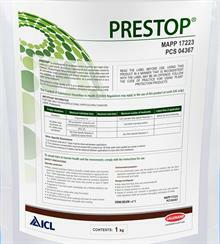 The beauty of Prestop is that it’s a very flexible product." Aerial treatments can help protect against grey mould and cankers caused by Botrytis spp as well as other aerial pathogens like Didymella (Mycosphaerella). Handily, the product can be applied in mixtures with compatible PPPs. However, these mixes should be applied immediately after preparation. To help growers get the most out of Prestop and use this ever-more popular biofungicide correctly, ICL has helpfully published a free, online guide containing recommendations for their crop sector. 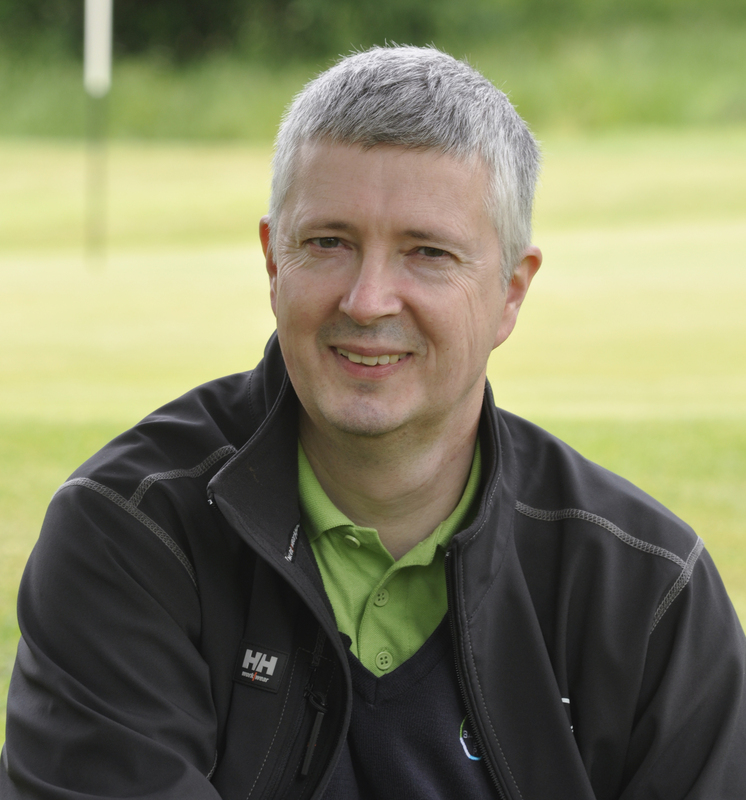 As the industry knows, there is always something new to learn in the horticultural world but, with technical sales staff on hand to help, ICL’s Levington Advance Solutions service arguably gives growers peace of mind. With the team’s extensive knowledge and leading PPPs such as Prestop and Exemptor forming part of ICL’s portfolio, growers can rest assured that they can grow, nurture, and protect their delicate young crops in the best possible way. *Exemptor contains thiacloprid (MAPP 15615). Please use plant protection products safely. Always read the label and product information before use.